Offering Hot Bar Hand Sealing Machine. Our clients can avail from us Bag Sealing Machine. Heat Sealing Machines can be supplied in single or multi-layered form as required for the application and is assembled from a wide range of technically advanced and high performance fabrics. We also custom design Expansion Joints to meet the client’s size and heating requirements. The technical parameters of the fabric expansion joint depend upon the fabric materials used for its assembly. Machine construction : Pneumatically operated Jaws. Temperature zone : Upper Jaw and lower jaw both have separate heater with separate temperature control device fitted. Heat sealing machine used for seal bag through heat. Its used for sealing product bag. Keeping the diverse requirements of customers in mind, we are instrumental in providing Pat Heat Sealing Machine. 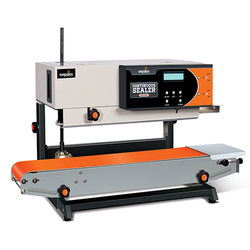 DESCRIPTION: • Super impulse sealers are designed for packaging application and occasional sealing applications. • Polyethylene, PP, HDPE, HM and other thermoplastic material films up to 1000 gauge can be sealed. • Manual foot pedal operated. - Seal Pattern : Straight lined or as per your design. - For sealing heat sealable poly pouches. - Hand operated.Impulse (instant) sealing. - Audio and visual sealing indicators. - Ideal for use in shops and bakeries. The Equipment is known as Heat Sealing Machine, Heat sealer, Heat sealing Tester, Gradient Heat Sealer, Digital Heat sealing Machine, Heat Sealing Testing Equipments, etc. - We use high-tech lacquer coating machines from Lenze, Germany. These six drives lacquer coating machine ensures consistent web tension through out the web length. - High Speed Machine with 12meter length of drying tunnel with high speed blower ensures odourless coated material.